This is our ‘runseeing’ tour of the historic capital of PEI. It’s a great combination of older government buildings, historic parks and squares, Victorian homes, fun shopping streets, and several pleasant sections along waterfront paths and boardwalks. We start at Rochefort Square, near several provincial government buildings (mix of nice and not so nice). Run along the outer perimeter of Victoria Park, to the beginning of the waterfront path (can do an extra 1-1.5 km in the park). Run along the path for 1.5 km, with nice views of the park and water, past the Beaconsfield Historic House. Continue following the roads/paths along the water (West St./Richmond St./Rochefort St.), heading back along a water path to the Queen Charlotte Armory. 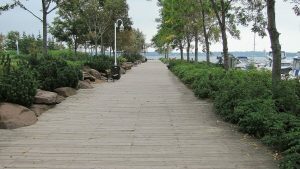 After a brief section back on Water St., follow the lovely boardwalk path around the merchants of Peak’s Wharf, and continue on the path around Confederation Landing. 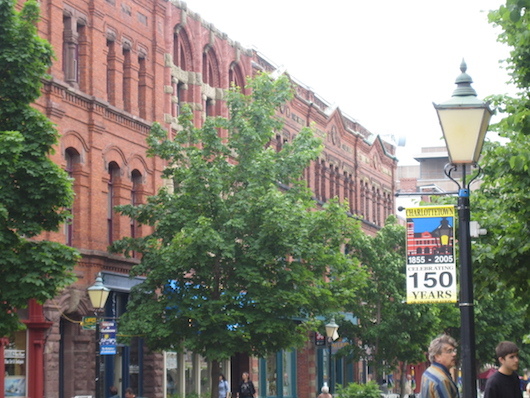 The final section follows some of Charlottetown’s important streets: Great George St., away from the water, passing impressive, St. Dunstan’s Basilica to the Confederation Center of the Arts and Victoria Row pedestrian area. Then take a jaunt down Queen St., passing lots of shops and restaurants, RIGHT on Water St., and then up Pownal St., passing Connaught Square. Add-Ons: ~1.5 km of paths in Victoria Park. Can continue on Water St. toward Hillsborough Bridge, or enjoy the other pleasant walking streets of Charlottetown.